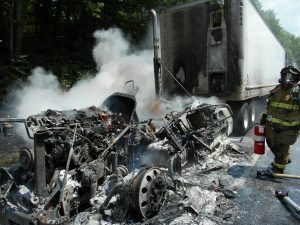 Fire Districts 17 & 16 (Albrightsville) were dispatched to a reported tractor trailer fire on Interstate 80 near the 275 West bound mile marker in District 17. 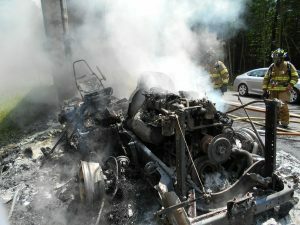 Upon arrival, Engine 17 went into service with hand lines to begin extinguishing the fire in the cab, which was starting to impinge on the trailer which was loaded with furniture. Chief 1701 called for mutual aid from White Haven Fire Company, and then from Monroe station 41 (Tobyhanna). Units from Dennison Township and Freeland were also called for manpower due to the extremely hot and humid weather. Crews then began to ventilate the trailer by cutting several holes in the trailer. Lake Harmony was on scene for 4 hours.